Order your own copy of "1950s American Style" here. In the 1950s, television transformed show business. American cars were instant classics. American music took the world by storm. Magnificent movie palaces were showing MGM musicals. American passenger trains were admired worldwide and baseball was the American pastime. Informative and detailed, this reference guide brings back scores of reflective glimpses of middle class America in the 1950s. 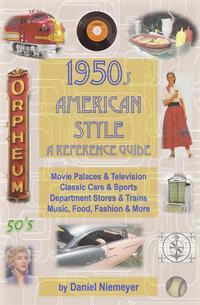 You can order a copy of "1950s American Style"
in soft cover for $19.50 $18.52 or hard cover for $29.99 from Lulu.com. in soft cover for $19.50 from Amazon.com.